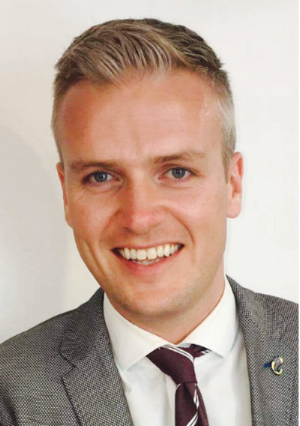 Dr Gerard McGowan is a consultant ophthalmic surgeon and retinal specialist graduating from the University of Aberdeen in 2005. He completed 7 years of ophthalmic training at the Tennent Institute of Ophthalmology, Glasgow. He subsequently entered into a 1 year advanced medical training vitreoretinal fellowship in Glasgow. This was followed by a second international vitreoretinal and medical retina fellowship at the world renowned Royal Victorian Eye and Ear hospital, Melbourne, Australia. His main research interests include the quantification of metamorphopsia and the incidence, current management and future treatments of acute large submacular haemorrhage. Dr McGowan is the principal investigator for the Scottish Ophthamological Surveillance Unit Study which aims to be the first study in the world to identify the incidence of acute large submacular haemorrhage. Mr McGowan serves on the UK royal college of ophthalmologists surgical training faculty, which trains junior surgeons throughout the UK. He also sits on the national ophthalmic selection panel. He has given 20 international presentations and published in highly regarded peer review journals. He has recently been appointed to the ESASO VR faculty to train European vitreoretinal surgeons in Switzerland. Mr McGowan is one of the UK's busiest vitreoretinal surgeons, performing up to 10 vitreoretinal (and 8-10 cataract) procedures per week . He is head of the prestigious vitreoretinal fellowship at the Tennent Institute of Ophthalmology in Glasgow, which is the largest eye department in Scotland. McGowan G, Yorston D, Strang NC, Manahilov V. D-CHART: A Novel Method of Measuring Metamorphopsia in Epiretinal Membrane and Macular Hole. Retina 2015 Oct 5. [Epub ahead of print] PubMed PMID: 26441261. Moore PP, McGowan GF, Sandhu SS, Allen PJ. Klebsiella pneumoniae liver abscess complicated by endogenous endophthalmitis: the importance of early diagnosis and intervention. Med J Aust. 2015 Oct 5;203(7):300-1. González-López JJ, McGowan G, Chapman E, Yorston D. Vitrectomy with subretinal tissue plasminogen activator and ranibizumab for submacular haemorrhages secondary to age-related macular degeneration: retrospective case series of 45 consecutive cases. Eye (Lond). 2016 Apr 8. doi: 10.1038/eye.2016.65. [Epub ahead of print] PubMed PMID: 27055681. Incidence, current management and future treatments of acute large sub macular haemorrhage (SMH) secondary to age related macular degeneration. Principal investigator for the SMH Scottish Ophthamological Surveillance Unit Study which aims to be the first study to identify the incidence of acute large submacular haemorrhage.